Concrete cutting can be dangerous, so it is important to make sure that your workers are taking it seriously and are approaching it with the right mindset. Concrete cutting can be dangerous, so it is important to make sure that your workers are taking it seriously and are approaching it with the right mindset. Whether they are sawing or drilling through concrete, it’s important that everyone understands the fundamentals of how to do it right. Once upon a time, your company might have relied on jackhammers, but technology marches on. Even so, here are the basics of concrete cutting. Diamond saw: Diamonds saw run faster, make more accurate cuts, and require less operator supervision; they’re also quieter and can cut through other materials, such as rebar. Concrete wall sawing: Circular blades set into a track are your best tool for making cuts into concrete walls. Wire sawing: Wire sawing is used for more demanding concrete cutting jobs where the other methods will not suffice. A cable covered in diamond fragments forms the “wire” that makes a surprisingly effective cutting edge. Core drilling: core drilling is also used to open up spaces in walls and floors for pipes, electrical wires, and air vents. Flat sawing: Floors, pavements, and other flat surfaces will require you to exercise the flat sawing method. Depending on what you need to do while cutting concrete, you will need to use a wire saw, a flat saw, and a wall saw. Machines can also make your lives easier. While holding these machines, your workers only need to guide them after turning them on; they do the rest. These machines will have wheels or blades as their cutting mechanism. No matter what type of cutter they have, these machines are engine-powered, feature hydraulics to add cutting power, and can also incorporate components such as air compressors and electric-powered motors in place of the gas-fed ones. 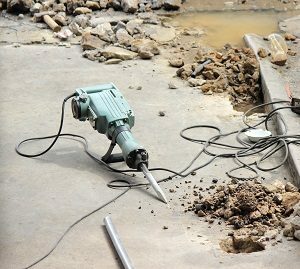 Determine which parts of the concrete need to be cut first. Some initial markings will make the job easier. Then start with a hand saw to make your first cut, which can be as much as four inches deep. If the concrete is deeper than four inches, then you should rely on a concrete cutting machine over a handsaw. Make sure you cut as far as you need without going too far in or making the cuts too shallow. Likewise, slowly move the saw or cutting machine so that it doesn’t over-spin, which might cause it to overheat and shut off. Keep the sawdust away from interfering with the operation of the saw you are using to complete the concrete cutting process. This entry was posted on Friday, June 8th, 2018	at 12:50 pm	. Both comments and pings are currently closed.